There's a Secret to Winning This Game Every Time. Can You Spot it? 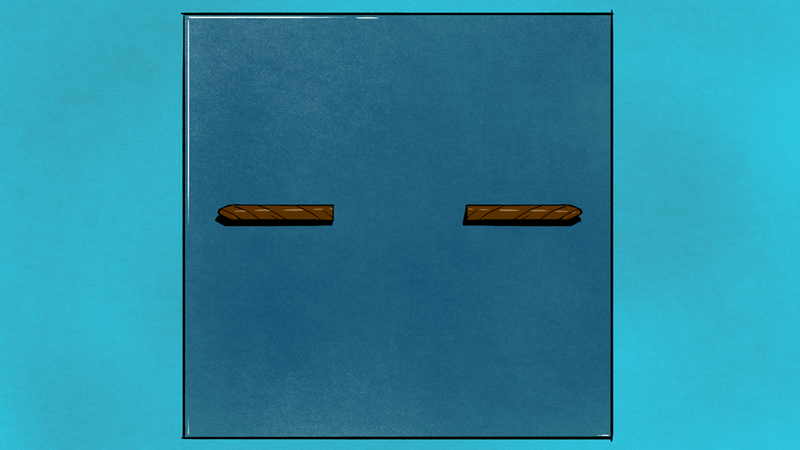 In this week’s puzzle, two players face off in an unusual tabletop game. It’s one you can play yourself—and, if you know the strategy, win every time. Two people are seated at a square-topped table. One places an ordinary cigar (flat at one end, pointed at the other) on the table, then the other does the same, and so on alternately, a condition being that no cigar shall touch another. Which player should succeed in placing the last cigar, assuming that they each will play in the best possible manner? The size of the table top and the size of the cigar are not given, but in order to exclude the ridiculous answer that the table might be so diminutive as only to take one cigar, we will say that the table must not be less than 2 feet square and the cigar not more than 4½ inches long. With those restrictions you may take any dimensions you like. Of course we assume that all the cigars are exactly alike in every respect. Should the first player, or the second player, win? Last week I asked you to identify an unusual book in an unusual library. Said library contained no two books containing the same number of words, and a total number of books greater than the number of words in the largest book. The challenge was to deduce how many words one of the books contained and what the book is about. If there are two books the greatest number of words possible is 1 and the other must have zero. Since the number of books is greater than the number of words in the largest book without repetition in number of words the number of books will always be one more than the number of words in the largest book and there will always by necessity be books with every number of words possible less than the largest book and there will always be a book with no words to increase the total number of books. This assumes (correctly) you can’t have books with negative number of words. 2 books: 0 words and 1 word (singular/plural is (are?) weird .. how can you have multiple zeroes ... anyway). 3 books: 2 words, 1 word, 0 words. n books: n-1 words, n-2 words ... 0 words. Imagine fifteen pigeonholes and sixteen pigeons. A storm comes along, and all of the pigeons take shelter inside the pigeonholes. They could be arranged any number of ways. For all we know, all sixteen pigeons could be inside one hole, and the rest of the holes could be empty. What we know for sure, no matter what, is that there is at least one hole that contains more than one pigeon. The clue I provided you last week—the riddle asking whether there are at least two people on Earth with the same number of hairs on their heads—was meant to get you thinking about the pigeonhole principle, even if you’d never heard it referred to by name. Because the number of people on Earth far exceeds the number of hairs on the average person’s head (or even the hairiest person’s head, for that matter), we can say with certainty that there must be at least two people with the same number of hairs on their heads. For example: Imagine if humans could only grow zero, one, two, or three hairs from the tops of our heads. Now imagine a world population of ten people. The pigeonhole principle dictates that at least two people must have the same number of hairs on their heads, because the number of “pigeons” (i.e. people) exceeds the number of “pigeonholes” (i.e. hair-number variations). In reality, the global population exceeds the number of hairs on a human’s head by several orders of magnitude. But the number of books in a library need not exceed the wordcount of the longest book by so much, as Hawkingdo’s example illustrates. Contact the author at rtgonzalez@io9.com. Illustration by Jim Cooke.